Thanks to GLC for this beautiful strategy, which is a modification of the original Star system by Carsch. I was going to keep this progression for myself, but since I started talking about The Star system, my magnanimous half has risen to the fore. You can count your lucky Star. Yuk, yuk. Get it? That represents the base bet, recovery 1 and recovery 2 for a total of 900 units. Our brother Carsch came up with an ingenious bet method. Here's my tweak to represent -999 units fashioned after F_LAT_INO's 1000 unit bankroll requirements. That's 999 units if you lose it all. Any win leaves you at a new profit. Of course you could eliminate the last 3 bets and save yourself 600 units of bankroll. Very few of you will be interested in this, so I'll just give a short example to firm up your understanding. Original Start the 1-1-1-2 represents what he calls a pre-progression and is played as parlays. The 5-10-15-25-40 are repeated, so you must win 2 times in a row to win. Carsch's are either repeats or parlays. Every double win in Carsh's basic bet nets you +2 units. My tweak starts out just like Carsch's except that I add another step of repeat, parlay. So at the 2 level you bet 2 and then repeat for +4. If you lose you go to the next 2 which is a parlay. 2 wins 2 more for 4. Parlay the 4 for 8. If you lose this level go to the final 2 level. 2 wins 2, repeat wins 2 more for 4, parlay the 4 for +8 -7 (previous losses) = +1. Okay, I can see that everybody's eyes glassed over at the original Star progression so I post this for posterity and so I know where to find it in the future. I just hope this forum stays intact. It has all my roulette notes on it. We can stay at the 1-1-1-2-2-2-5-5-5-13-13-13 for 63 units on the base level. If we lose we can play 2-2-2-4-4-4-10-10-10-26-26-26 for 126 units in recovery 1 level. If we lose we can play 6-6-6-12-12-12-30-30-30-78-78-78 for 378 units in recovery 2 level. That's 567 units if we lose all 3 levels. I'm sorry for the blanks. You should be able to fill them in. Too much typing. You might think that it would be better to just do parlays every time, but I think the repeats give us some leeway because a win and then a loss gives us another shot at it. Whereas with a parlay a win followed by a loss ends it. I am currently scripting the Star System + mods. Could you please tell me what happens at level 3 (Repeat + Parlay) in case I've interpreted that wrong? I get the rest of it: Repeat = place the same bet; Parlay = let it ride (in both cases we are aiming for 2 wins in a row). Level 3 I am just a little confused how they should be combined exactly. Any updates to report on since your historical posts above? I'm sorry, it does get a little confusing. On the Parlay/Repeat: Let's say we're at the 2 unit starting level. We play 2 units and win so we have 4 units. The parlay part is letting the 4 units ride. A win will give us 8 units. Now we repeat the 4 unit bet and a win gives us +12 units. For the Parlay/Parlay. Bet 2 units and win so we have 4 units and we let it ride for the parlay and a win gives us 8 units. For the 2nd parlay part, we let the 8 units ride and if it wins we have 16 units. Subtract the 2 we started with and we've netted 14 units which should be enough to off-set all previous losses. Beware! This is a martingale type bet pattern. 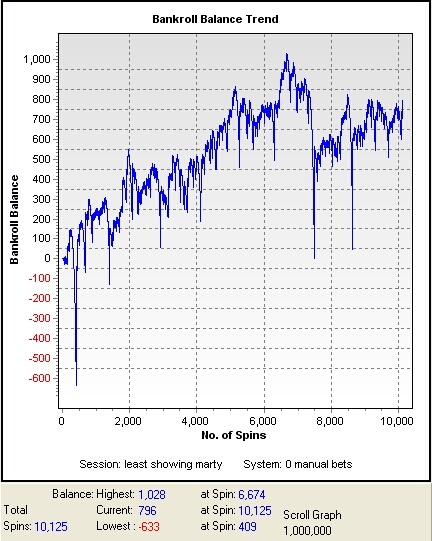 It is a mixed bet style martingale, but it has all the pros and cons of a basic even chance martingale. You should win on a regular basis, but every now and then, you will have a major loss. Remember to only count 5% of all winnings as potential keepers, very potential with a lot of luck.